What is it that makes Anji Play so special? Well, it’s a number of things, but for today, let’s talk about the careful curation of play materials. You might notice that I’m not using the word “toys” here and that’s because, at least to me, “toys” so often mean single-purpose, closed-ended playthings and the materials used in Anji Play are often things that are used by adults too – ladders, planks, blocks of wood, sand, paint, clay, cardboard, etc. 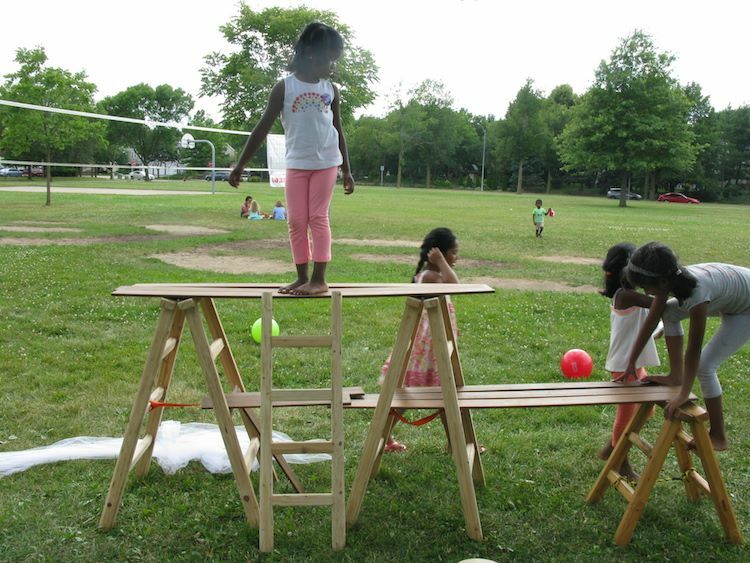 When I started doing Anji Play programs outdoors at my library, I thought I’d need to add in a new plaything each week in order to keep it fresh for participants, but over the course of the summer, I realized that the new elements drew a lot of attention each week, but that often meant that there wasn’t as much repeat play from week to week and repeat play is KEY to the learning process. When kids encounter new materials, first they must explore the material – what are its characteristics? What can it do? What can I do with it? Second, they experiment with the play material. 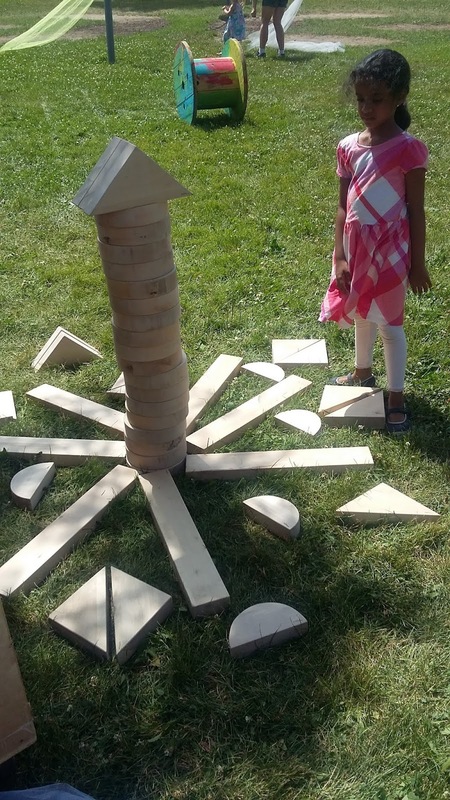 If this is a truly engaging material, this experimentation stage can take years of repeat play, of kids trying to do new things with the same materials. Finally, over time, they achieve a sense of mastery of the material—a deep and abiding understanding of the properties and possibilities afforded by that particular plaything. If I am constantly introducing exciting (distracting) new materials, kids never get much past the exploration stage and the play stays superficial and expected. If you want to see really deep play and innovative ideas explored don’t be afraid to offer the same materials week after week after week until the kids demonstrate mastery (hint: sometimes this can look like boredom, but other times it can lead to imaginative play where the kids spend less time on "how" and more time on imagination -- less time building the house, more time playing in the "house"). For my indoor program which had, obviously, much less space than my outdoor program, I had to curate the materials quite carefully. 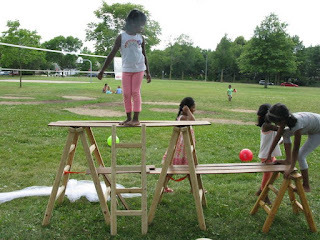 I wanted there to be a block play area, some gross motor equipment that would be challenging but not so big that it takes over the room, and some sort of open-ended, fine-motor/art area. I also wanted some materials that infants could engage with as well as materials that could be enthusiastically and creatively used by older children. I’ve used the same materials for the last few months with only small additions and changes here and there over time. Towards the end of the series, I began whittling this collection down. If there were materials that the kids weren't using, I stopped putting them out and no one seemed to mind. There never felt like there was a lack of things to play with and I don't think I ever heard a kid say, "I'm bored." I hope to be able to add more AnjiPlay specific materials as the years go by because I've seen how the quality and depth of play increases dramatically when the kids can use these special materials, but for now, these simple materials, gathered from different sources, seemed to work well enough.